The whole chapter is the same as on p. 101 in SLC. The whole chapter is the same as on p. 139 in SLC. Feliks Koneczny (1862-1949) never wrote a book enti-tled The Latin Civilization, but he did write about it in all of his works. 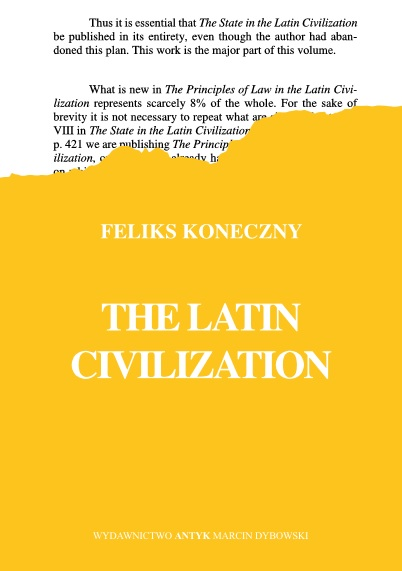 The present volume contains a compilation of several texts that deal specifically with the Latin civilization. These are two books, The State in the Latin Civilization and The Princi-ples of Law in the Latin Civilization. The close relationship be-tween these two books is explained in the Publisher's Note of their London (1981) edition. Also some short fragments per-taining specifically to the Latin civilization taken from several of Koneczny's smaller papers are included. 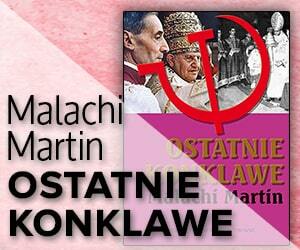 Finally this is fol-lowed with the booklet The Church as the Political Educator of Nations. 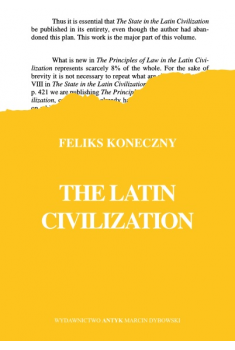 There is much about the Latin civilization in other books of Koneczny that have already been translated into Eng-lish. These can be consulted directly by English readers . As in the previous translations of Koneczny's books, all additions that come from the translator are given in square brackets [ ]. Koneczny wrote for the Polish intelligentsia of his generation assuming a certain level of general knowledge of languages, culture and history, both Polish and universal. Where the translator considered it necessary to add some ex-planation, either in the text or in the footnotes, this is in square brackets. The compilation of texts was done by the translator.